It is thought that the areas with no dust are an indication that the saddle is not touching in these spots when it is in fact often the opposite. This has inspired me to write a post decoding what a dust pattern is actually saying to a saddle fitter. The following pictures will summarize what a good looking dust pattern is and why this is what we are looking for. Picture 1: This is from a horse who was ridden without a saddle pad during a saddle fitting. One of the reasons we do this is so that the dirt doesn’t get stuck as a mirror image on the pad but stays on the horse. This is so we can see if the saddle is straight and if there are any pressure points. Picture 2: This pattern is first of all showing us that the saddle isn’t sitting on the shoulder or behind the ribcage. These are both indicated by the blue lines. Picture 3: The area highlighted in yellow is where the least amount of movement happens in the saddle. The more movement the more dirt is brought up from under the hair. This is a good, large, section under the saddle that is sitting stable on the horse. Picture 4: The area highlighted in green is where there is a little more movement under the saddle. It is important that the entire saddle is not clamped down to the back of the horse. As we move towards the cantle there is more flexion and movement in the back and the saddle needs to allow for this. Also changes in direction effect the saddle more towards the cantle. Picture 5: This last area, highlighted in red, is where we see the most movement in the saddle. 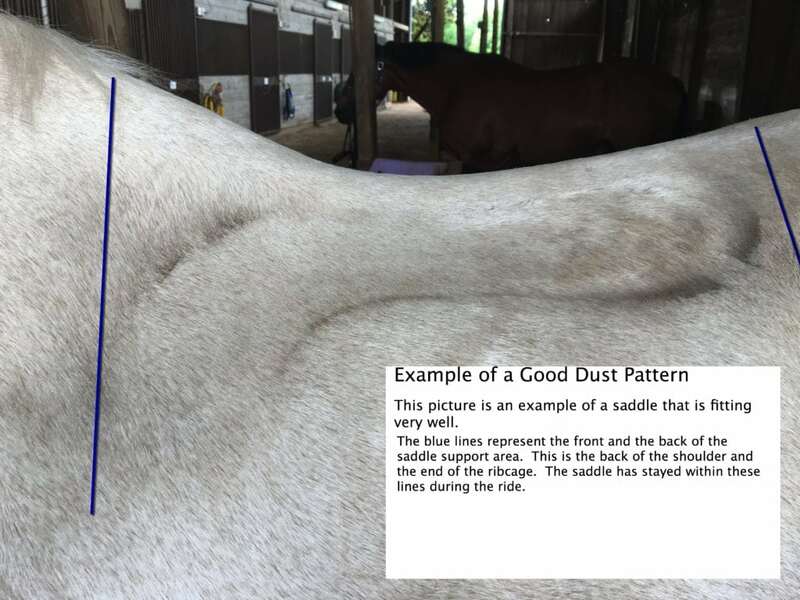 It shows us that the shoulder is able to move under the front of the saddle creating a dirt mark at the front and that the back edge of the saddle isn’t pushing into the loin but is allowing it to move. When this saddle was being ridden in it did not rock or bounce, but allowed for the natural movement of the back. You can also see that the dust is staying well away from the spine keeping the pressure across the ribs. 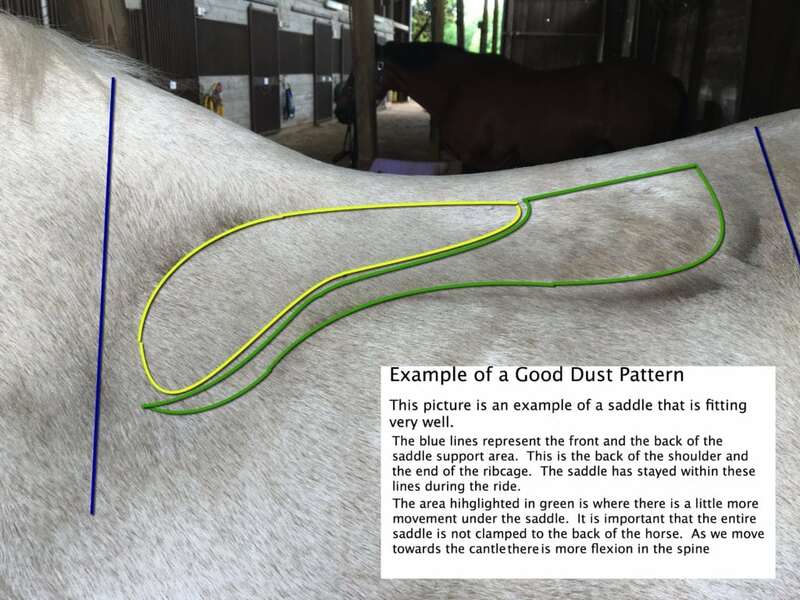 If your saddle is giving you a dust pattern that look like this or close to this you most likely have a good fitting saddle. 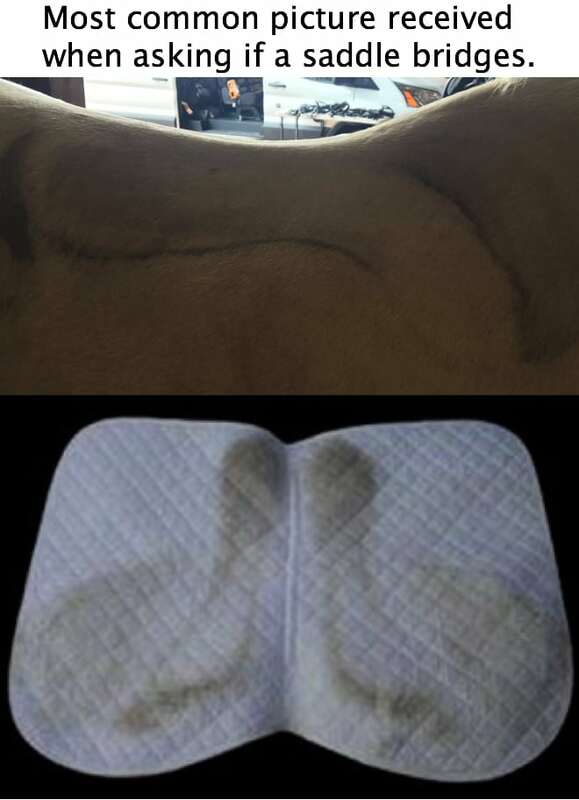 If you have any questions about your own saddle pad patterns please feel free to send a picture to me at kristen@saddlerysolutions.com and I will be happy to evaluate them. I am also available for on site consultations in Northern California. Very helpful article – I’m off to apply it to my own horses! And will be showing a sweaty numnah to the saddle fitter next visit. Thank you. When there is a dry patch , when you take the saddle off, where there is no sweat is that too much pressure ( pinching) or no pressure so the sweat dries? It depends on the size and placement of the dry area. It also depends on how long the ride was. If you do a long ride and the horse is very sweaty there should be sweat under the saddle. One area might be less wet (the area with the least amount of movement) but should still have sweat on it. If there are dry patches and the horse is very sweaty there is focal pressure in that spot. What if you have bridging on one side only without compromising the rest of the “good” fit. Then I would address the bringing with either reflocking the saddle or shims. The panels may need to be balanced or an asymmetry in the horse. My horse is liver chestnut and harder to see the dust pattern. Can I use a white thin saddle pad and apply the same principles but backwards? You can also do the same evaluation from a pad. Just make sure the pad is on completely straight under the saddle before you start to ride so the results aren’t skewed to one side.